Adam (Eric Jungmann) and Harley (Justin Urich) are on a race to drive across the country to tell Adam’s ex-girlfriend that he still loves her before she gets married. Along the way, they run afoul of a maniac in a bizarre monster truck. 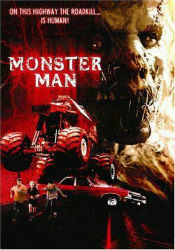 The truck is driven by a deformed creature named, Bob (Michael Bailey Smith). Local legend says that Bob likes to steal peoples' limbs, but let the victims survive. The duo find a stowaway hitchhiker in the back of their car named, Sarah (Aimee Brooks). The group try and keep out of Bob’s clutches (and out from under his giant tires), but little do they know that they are slowly being trapped in a web of black magic and mutilation. I’m usually suspicious of horror-comedies, it’s very difficult to get the balance right, and more often than not, a film will lean on the comedy to the point of diminishing the horror. Monster Man does exactly that, but it was funny and enjoyable enough that I didn’t really mind. The real star is Bob’s monster truck, which is a marvelous bit of engineering. It exudes a bestial personality. What could have been a fairly rote chase movie, actually puts some effort into its story and pulls off a few twists that I didn’t see coming. When Monster Man wants to be humorous, it succeeds, and when it wants to be gross it succeeds even more. Perhaps it was going in with lowered expectations, but Monster Man was a delightful surprise.